Debi Hubbs, artist, has a website, Debi Hubbs Illustration. Her sense of humor, shown in her paintings, proves that art is fun. We chose examples of her art to imitate. We first drew the picture, and then colored in the background (negative spaces) with black. Included in this lesson is a PowerPoint presentation of Debi’s art. 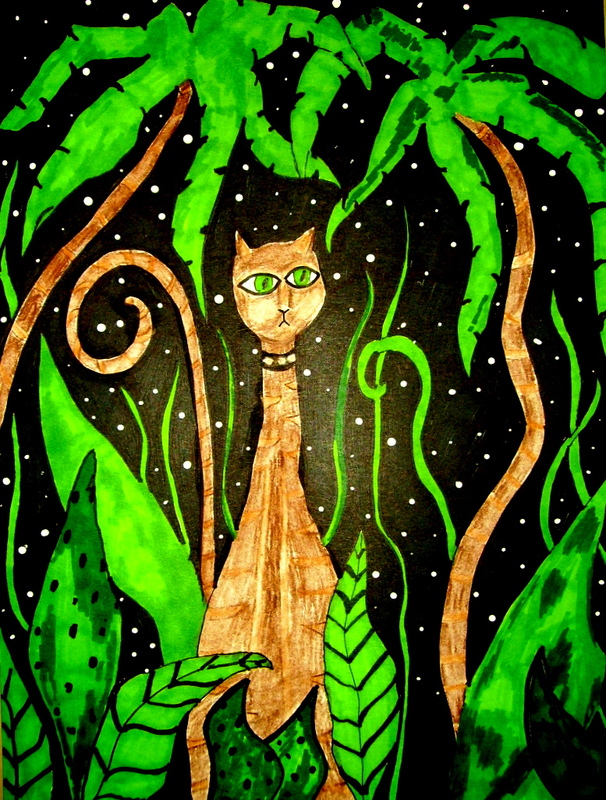 Directions for this project , “Jungle Cat,” is in the 6th Grade Projects Gallery in the sidebar. This entry was posted in 6th Grade, Categories and tagged 6th grade, art for kids, arts and crafts for kids, debi hubbs, debi hubbs inspired art, jungle art for kids, jungle cat, negative spaces. Bookmark the permalink.